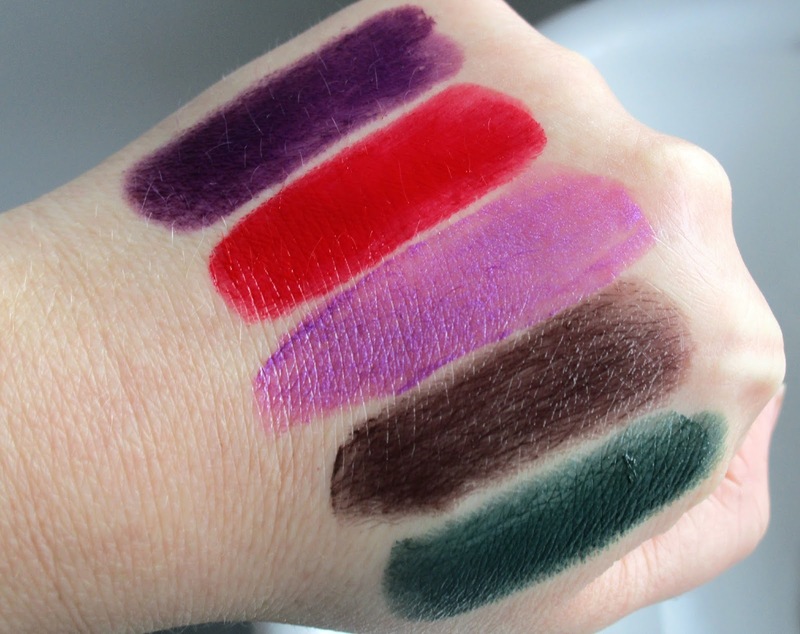 Today I'm back to share yet another new release from our friends over at Makeup Revolution! 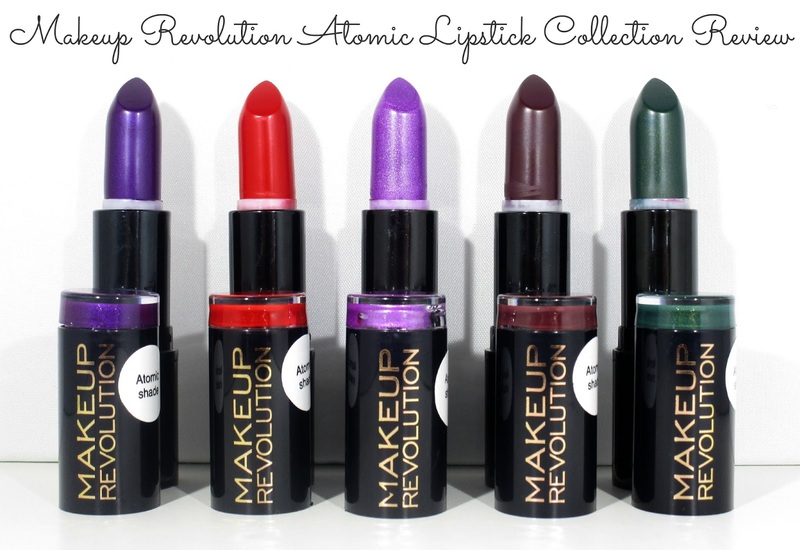 This time around Makeup Revolution have released 5 all new lipsticks named The Atomic Collection* which retail for 1 teeny, tiny little pound each, that means you can pick up the whole collection for just £5.00, BARGAIN ALERT! The Atomic Collection really does pack a colourful punch, the shades are quite deep in tone which is great for this time of year and the more daring shades are ideal for any up coming Halloween party's that you might be going to and if not they are great shades to have in your makeup collection anyway, I mean you never know when your might need a green lippie he he! As I said before the Atomic Collection consists of 5 all new shades, 3 of which have a shimmer finish and 2 have a cream finish, below I have listing the shade run down for you! ♥ Make It Right is a gorgeous dark purple shade that looks slightly metallic in some lights which I love as it makes the lips appear glossy, it does also contain some ever so slight twinkly shimmers but nothing over the top or disco ball like he he. ♥ Atomic Ruby is simply stunning, its a classic bright red shade that I can see myself wearing alot, it doesn't contain any shimmers at all and looks amazing teamed with black winged liner. ♥ Make Me Magnificent is a shimmery light purple-pink shade, it can be applied sheer or build up for a more intense look. ♥ Make Me Tonight is a dark brown shade with a slight plum undertone, I did think it would have been more plum toned than brown looking at it in the bullet but I was mistaken, theres no shimmers in this one, just pure creaminess ha ha. ♥ Atomic Serpent is a dark forest green shade that has gold shimmers running through it, not such a wearable shade but still amazing. The quality of each lipstick in the Atomic Collection is amazing, they all have great pigmentation and some have the ability to be worn more sheer or you can build them up for an intense pop of colour, they all glide onto the lips super smooth and have such a beautiful creamy, moisturising formula but I find all the Makeup Revolution Lipsticks have that awesome creamy texture. As for lasting power... Make It Right and Atomic Ruby lasted on me a good 4-5 hours, I put this down to their great quality and amazing colour payoff, Make Me Magnificent lasted a good 2 hours or so but it is more sheer/subtle that the other lipstick shades so that's to be expected and I have to be honest I haven't gone out in Atomic Serpent (green) or Make Me Tonight (brown) so I cant really say how long would last however I expect as they are bold, intense colours they would last well. The packaging of each lipstick is nice however the lids seem to hate me and fly off so easily all the time, but I love the sleek black casing and the little cap of the same shade of lipstick in the top of each lid is cute and makes finding your chosen lipstick shade super easy whilst they are in your lipstick holders or storage. Overall I think the Atomic Collection is an absolute hit, yes the shades wont be every ones cup of tea nore are they all wearable for everyday use but to find shades like this on the high street for £1.00 each that are amazing in quality is brilliant in my opinion. My favourite shades in the collection is definitely Atomic Ruby and Make It Right, arrhh I just love them so much! 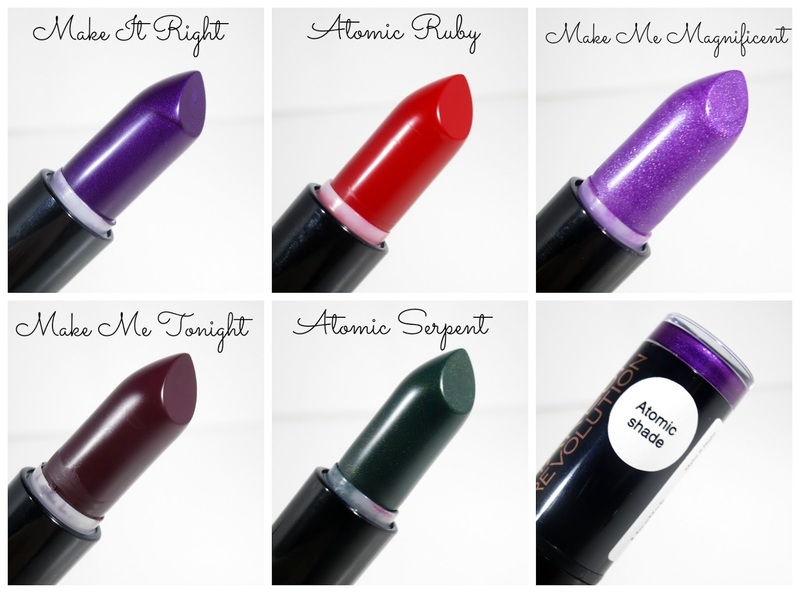 What's your favourite Makeup Revolution lipstick shade from the Atomic Collection beaut's?? I'd love to know. I have this collection too. I've tried a couple out and found them a bit tricky to apply as they were a bit watery/thin. I think if I apply them with a lip brush they might go on a bit better. The colours are great for Halloween, especially the green. I think I'm in love with Make It Right, all the others (save Atomic Red) seem a little dress-up but I think Make It Right could be an every day colour if you styled it in the right way. I can' really turn it down for a pound! I saw these on the Facebook page and I think they look AMAZING. The colours are soooo cool and some are iridescent which is awesome! I am a bit surprised that Make Me Tonight's formula doesn't seem consistent with the others as it appears patchy in comparison to the others. if that: make it right shade wasn't a bit frosty I would love it ! I haven't tried any of the Makeup Revolution lipsticks yet but I think I will have to! These look gorgeous - perfect for Halloween!